Even though they moved it back to March from May, I STILL couldn't wait for this week! It's the most fun event in North Florida, and we're so lucky to be able to host this amazing golf event. Sure, traffic is horrific, drinks are overpriced, parking is a nightmare and you'll have a sunburn for a week, but WHO CARES, TIGER IS PLAYING GOLF RIGHT IN FRONT OF ME!!!! It's just so, so wonderful. If you've never been, get tickets and go, you won't regret it. Going to TPC can be overwhelming - there's so much to see, so many places to eat, and 18 holes to watch! How do you know what to do?! Chairs. Bring foldable or beach chairs (without a bag cover), get there early, and park your chairs anywhere around the 17th or 18th hole. Just don't take my spot! Sunscreen, sunglasses, and a hat. Don't forget to slather your nose, ears, and feet (if your shoes are open). If you forget, there's usually people giving away sunscreen at the entrance. Comfortable shoes. Ladies, I know a good pair of wedges is *so cute* with a sundress, but you'll be regretting it before the afternoon tee times. 16th green bathroom. There are 4 non-portable bathroom sites, but the best bathroom is behind the 16th green. A Sawgrass Splash. Mmmmm. Photo courtesy of Levy Restaurants. Many players and golf analysts refer to TPC as "the fifth major" in golf. I couldn't agree more - it's got the largest purse of any tournament and has a great field of golfers on a historic course. Tiger Woods skipped the Arnold Palmer Invitational so he could be fully ready to play THE PLAYERS. He loves it, and rightfully so, considering he's taken the trophy home twice. TPC is also home to the famous 17th hole - a 132 yard par 3 "Island Green" that gives the best of golfers the heebie jeebies. One of my favorite things about attending TPC is that spectators might cheer when a golfer makes it onto the green, but they will go CRAZY when it goes into the water. Isn't that right, Sergio? 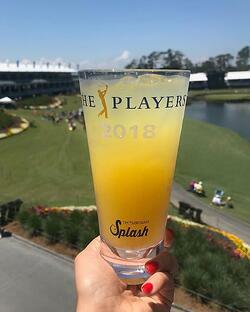 Will you be attending THE PLAYERS Championship this week? Let us know below!